The Wait is Over — Katharine Eliska Kimbriel’s Long-Awaited “Spiral Path” is Out! Along the way, Allie has faced a number of problems: a were-wolf. A soul-sucking vampire of an unusual type. Healing the sick, comforting the aged, and birthing a number of babies. She’s also met Azrael, the Angel of Death, and has been given a name by him — Alfreda Golden-Tongue — and appears to have more power than the average five other practitioners. 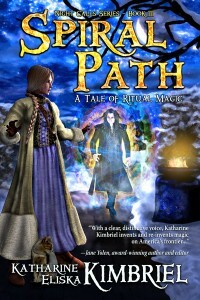 SPIRAL PATH opens with an unusual set of births. One is that of Allie’s much-younger sister, Elizabeth, who promises to be a force to be reckoned with down the line (we can tell this by the highly unusual things that happen during the birthing); the other is that of a unicorn. While Elizabeth’s birth is straightforward, the unicorn’s is not; in fact, the unicorn’s mama bespells Allie to help her rather than just ask, for reasons that probably make sense only to unicorns. It’s because of what the unicorn mama does that Allie is packed off to a first-rate magical school in the state of New York in order to learn how to better protect herself by the use of ritual magic. Because the next person (or unicorn, or whatever) who bespells Allie may not be benign . . . and Allie knows it. Of course, Allie isn’t told this is a first-rate school. She’s only told she’d better learn, and quickly, because her talents need honing. So she’s tested in various classes, taking lessons in some while teaching others, and has a number of interesting adventures — including one on the docks of old New York that I refuse to spoil. All of Allie’s adventures (not just the one in the port of New York) are rousing. And the quieter challenges Allie faces of being a farmgirl among some rather high-in-the-instep types at the specialty school are equally absorbing. But the best moments are those between Allie and her almost-boyfriend, fellow practitioner/student Shaw Kristinsson. (I say “almost” because Allie is, after all, only thirteen.) These interpersonal moments show Allie at her best — which, oddly enough, is also when Allie is just like anyone else: a bit shy with her friend, who she wants someday to be more than a friend . . . but still herself, with joy and sorrow intermixed as it is for any living creature. It’s because of these moments that I seriously considered holding this review for SBR’s Romance Saturday promotion. But SPIRAL PATH, all in all, is more than a romance: it’s all about finding yourself, even if the person you are consists of layers within layers without end . . . a spiral path indeed. Bottom line: SPIRAL PATH was most definitely worth the wait, and is a worthy addition to the outstanding Night Calls series.